The Office for Civil Rights is ramping up random compliance reviews as part of the continued evolution of the landmark privacy rule. The HITECH Act mandates that all covered entities—healthcare providers, clearinghouses, and health plans—comply with HIPAA privacy and security standards while requiring the Office for Civil Rights (OCR) to implement a program of periodic audits. To that end, in November 2011, the OCR launched a pilot program to perform up to 150 audits of covered entities to measure compliance in both privacy and security. 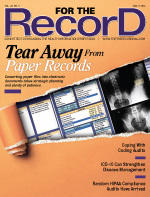 The process includes complaint resolution, an issue-based process by which the OCR investigates and follows up on some 10,000 complaints per year; compliance reviews, which now include HIPAA breach investigations and fall under two categories—those under 500 records that must be reported by the end of the calendar year and those involving more than 500 records that must be reported to Health and Human Services (HHS) within 60 days (the OCR must investigate all reported breaches, which average nearly 20 per month); and compliance reviews in cases other than breach reports. The new OCR audits add another element to the process by closely examining general compliance issues within an overall program. The audit’s initial phase features 20 covered entities: eight health plans, two claims clearinghouses, and 10 provider organizations composed of three hospitals, three physician offices, a laboratory, a dental office, a nursing/custodial facility, and a pharmacy. However, the OCR has withheld the audited organizations’ exact identities. “One thing that interests us is that 150 audits were scheduled for this year. The first 20 are pilot audits in the first six months. It’s very unlikely then that OCR will be able to reach the 150 mark,” says Daniel Berger, president and CEO of Redspin, a penetration testing services and IT security audit provider. Stephen Page, an attorney with Waller Lansden Dortch & Davis, says business associate agreements are coming under greater scrutiny as their role in future audits become clear. “A significant portion of our HIPAA engagements involve reviewing contracts in which covered entities are adding provisions to business associate agreements, such as indemnification clauses, that make the business associate responsible for the costs of the breaches they commit,” he says. KPMG, the firm contracted by the OCR to conduct the audits, has established a sequential process. Once KPMG receives the list of covered entities to be audited, it sends each organization a packet that includes an OCR cover letter alerting the entity that it has been selected for audit under the HITECH Act. The announcement also contains a letter from KPMG that delineates the audit’s timeline and initial requirements and includes a list of documents that must be produced within 10 business days. The KPMG letter goes on to provide information about the on-site audit, which can take place within 30 to 90 days of the letter date. KPMG will later give the covered entity five days notice before auditors arrive at the site. Once at the facility, KPMG auditors conduct a briefing, interview key individuals, tour the site, review paper documents, and search for proof that compliant policies exist. After the audit is completed, auditors conduct another briefing before leaving but can continue to ask questions for an additional two to three weeks. After 20 to 30 days, the auditors draft a report, which is sent to the site. The site has 10 business days to prepare comments and send them to KPMG. In response, KMPG can amend the report. Whether or not the firm chooses to change the initial report, all paperwork—the report and the site’s response—is sent to the OCR. Once the OCR reviews those documents, it can take various steps. The OCR can develop technical assistance and guidance or, in certain cases, it may choose to open a compliance review. It is currently unclear how much information the OCR will make available to the industry. While the intent of the audits is to work with covered entities to ensure their privacy and security measures are compliant, if there is evidence of willful neglect, as McMillan notes, fines could ultimately result. Each expert interviewed for this article cautioned that the time to prepare for an audit is well before KPMG’s audit packet arrives. Additionally, many service firms are actively offering preparation assistance to covered entities. Often, these services include “practice” OCR/HIPAA audits to help organizations get a sense of what to expect from auditors. Meanwhile, business associates are being proactive and ensuring they are compliant in order to avoid fines. Meanwhile, Apgar & Associates has partnered with ID Experts, a data breach prevention and remediation firm, to offer mock HIPAA compliance audits to help healthcare organizations prepare. Phoenix Cardiac Surgery, PC of Phoenix and Prescott, Arizona, has agreed to pay Health and Human Services (HHS) a $100,000 settlement and take corrective action to implement policies and procedures to safeguard the protected health information of its patients. The settlement follows an extensive investigation by the HHS Office for Civil Rights (OCR) for potential HIPAA Privacy and Security Rules violations. The incident giving rise to OCR’s investigation was a report that the physician practice was posting clinical and surgical appointments for its patients on an Internet-based calendar that was publicly accessible. On further investigation, the OCR found that Phoenix Cardiac Surgery had implemented few policies and procedures to comply with the HIPAA rules and had limited safeguards in place to protect patients’ electronic protected health information (ePHI). • Phoenix Cardiac Surgery failed to implement adequate policies and procedures to appropriately safeguard patient information. • The organization failed to document that it trained any employees on its policies and procedures on the Privacy and Security Rules. • The organization failed to identify a security official and conduct a risk analysis. • Phoenix Cardiac Surgery failed to obtain business associate agreements with Internet-based e-mail and calendar services where the provision of the service included storage of and access to its ePHI.